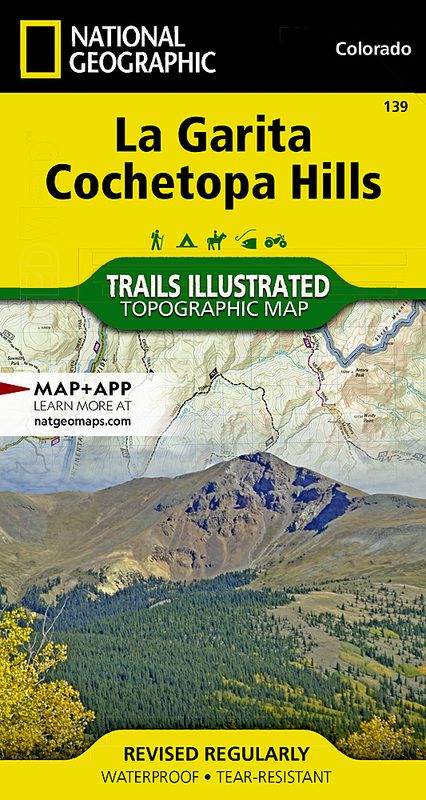 Expertly researched and created in partnership with the U.S. Forest Service, Bureau of Land Manangement and others, National Geographic's Trails Illustrated map of La Garita and Cochetopa Hills provides unmatched detail of this mountainous and forested area in southern Colorado. The map covers parts of San Isabel, Gunnison and Rio Grande National Forests, La Garita and Powderhorn Wilderness Areas, La Garita and San Juan Mountains, Sawatch Range, Silver Thread Scenic Byway and Continental Divide. Outdoor enthusiasts will be able to get off the beaten track and back on again by following the map to clearly marked trailheads and then along precisely mapped trails, labeled with their designated usage, whether traveling on foot, by mountain bike, motorcycle or snowmobile. The Colorado Trail and Continental Divide Trail, which merge for a large section of the map, are both highlighted. Among the map's many features are contour lines and elevations, labeled peaks and passes, water features and color-coded boundaries between public and private land. Recreation points of interest for all seasons appear as well, including campgrounds, boat launch points, fishing areas, yurts and ski areas. Other features found on this map include: Cochetopa Dome, Cochetopa Hills, Gunnison National Forest, La Garita Mountains, La Garita Wilderness, Mesa Mountain, Monarch Pass, Powderhorn Wilderness, Rio Grande National Forest, San Isabel National Forest, San Luis Peak.